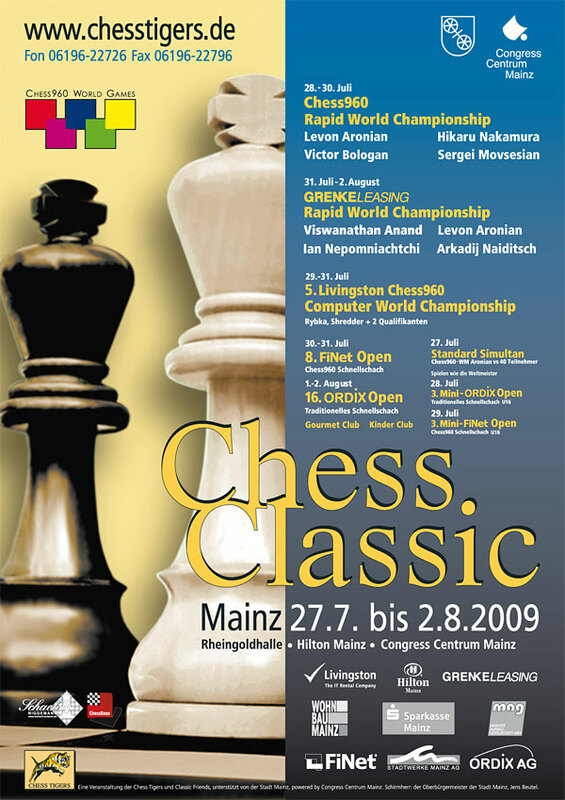 The 2009 Chess Classic is taking place from July 27 to August 2 in the Rheingoldhalle of the Congress Centre, Hilton Hotel in Mainz, Germany. The event includes tournaments and Opens in traditional and Random Chess, with stars like the current World Champion Vishy Anand, Levon Aronian of Armenia, strong Russian junior GM Ian Nepomniachtchi and top German GM Arkadij Naiditsch. The Livingston Chess960 computer world championship Rybka won her (remember, Rybka is a she) third world title. The program, developed by Vasik Rajlich, won the four-game final on Friday 3-1 against Shredder, and in the battle for third place DeepSjeng could secure bronze in the mini-match against Ikarus. In the preliminaries, Rybka crushed her opponents and scored an unbelievable “Fischer-like” score of 11.5/12 games. However, in the exhibition blitz Rybka lost her first game this week and it became obvious that the program is not unbeatable. In the first game of the final against Shredder, the German program possibly had a winning position, but Rybka found some tactical resources and even won the game in the end. Shredder-father Stefan Meyer-Kahlen commented: “The problem is that Rybka often finds these spectacular tactical escapes and in this game my opponent possibly searched deeper than Shredder”. In the other games Shredder had chances as well and all games were hard-fought. In the end Rybka won the final 3-1 (+2=2-0) and Rybka brainchild Vasik Rajlich received his third trophy from Chess Tigers treasurer Jürgen Wienecke. In the fight for third place, DeepSjeng convincingly won two games and seemed to be in cruise-control mode in game three and four. But Ikarus won both games, equalized the score and therefore a blitz tie-break was necessary. DeepSjeng won both blitz games. It was another nice tournament, which took place in a friendly atmosphere. The Belgian referee and games expert Hans Secelle had no trouble leading the world championship. The programmers discussed various complicated aspects of chess programming for hours on end. We will see the result soon, because Rybka and Shredder will release new versions of their programs this year! Visit www.rybkachess.net and www.shredderchess.com for the latest information about the new releases. Indeed none of the chess players in Mainz were able to solve this position, and Hans was convinced that computer would also fail miserably. So Frederic Friedel bet him a glass of whisky at the bar that Rybka would find the key move. "Not necessarily understand why it holds the draw," said Friedel, "but it will find the move by discovering that all other moves lose badly and quickly." Hans lost his bet, Rybka found the right strategy in one minute and two seconds. We will not show you the solution at this time. Just the following piece hint: when showing the solution to the GMs Hans Secelle would give the first white move and then speak for about 15 seconds. After that the GMs would nod and smile and say, "yes, that is right. Very neat!" The solution will be added in this article next week. Eleven rounds Rapid Chess Open, 20min/game + 5s/move. Registration until Sat 1 Aug, 11:30h. Sat 1 August: rounds 1-5; Sun 2 August: rounds 6-11. Start of rounds: Sat 12:00h, Sun 10:00h. Award ceremony Sun 17:30h. Details.